Joel Embiid labelled himself the "most unstoppable player in the league" after helping the Philadelphia 76ers beat the Boston Celtics. All-Star Embiid led the way as the 76ers rallied to overcome NBA Eastern Conference rivals the Celtics 118-115 in Philadelphia on Wednesday. 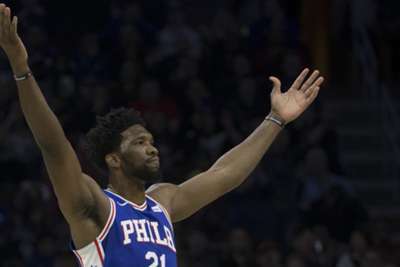 Embiid – who was involved in an altercation with Marcus Smart in the third quarter – finished with 37 points and 22 rebounds at Wells Fargo Center. "First of all, I'm glad we got the win," Embiid told ESPN. "I've been hearing these guys can guard me better than anyone else. "I just had to come out and show that I'm the most unstoppable player in the league." The 76ers had fallen to the Celtics in their first three matchups this season, while Philadelphia had gone 2-17 in regular-season games against Boston – who eased to a 4-1 series in the playoffs last term. Celtics star Kyrie Irving tallied 36 points in the losing effort but was just three of 13 from three-point range. "I just missed some easy ones tonight," Irving told reporters after the game on the road. The 76ers improved to 47-25 with the victory, while the Celtics dropped to 43-29.